Have you every held a sea shell (conch shell, specifically) to your ear and heard the rhythmic, soft sound of the ocean? The Ujjayi breath resembles that sound very much…and is soothing and deeply relaxing. This is the second article in a series of Pranayama (yogic breathing) articles. To read the previous article, see the Complete Breath (3-Part Breath). Find either a comfortable seated position with the spine straight, or lie down on your back. Take a few deep breaths, relax the body, relax the mind. Take a slow and steady inhalation while half closing the glottis in the back of the throat. The glottis is what closes when you swallow. When breathing with the glottis half closed, the breath makes a soft hissing sound. To learn how to make this sound, open the mouth and whisper “ahhhh”, close the mouth and continue with the same “ahhhh” sound. Exhale the same way with the glottis half closed. Make each inhalation and especially each exhalation as long as possible. Empty the mind and become absorbed in the soft ocean sound. Do at least 5 minutes, going up to ½ hour when feeling comfortable enough. Benefits: quiets the brain, same benefits as Complete Breath but deeper. 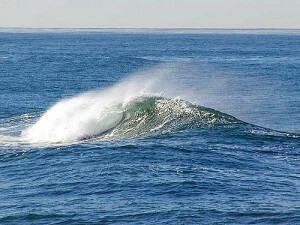 With practice mind becomes very absorbed in the ocean sound, which induces meditation and a deep relaxation.